← Great Master Shri Sujnan Giri Explains: Why do we Worship Millions of Gods in Hinduism? 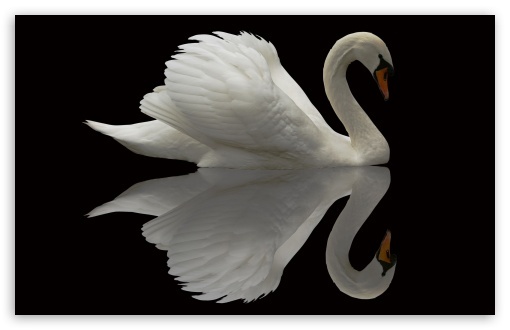 Hamsa (Swan) Symbolism: Universal Self (Paramahamsa) Reflected as Individual Self (Hamsa) in all of us. This is a vagartha article. In other words, we will discuss a word and its deeper meanings. If you have studied Indian philosophy, especially Upanishads, in some or the other instance, you would have seen a mention of the word Soham. Just like holy Hindu sacred syllable Om, the word Soham also has several esoteric connotations. With Guru’s Grace on our side, we will attempt to provide a drop of nectar from the ocean of meanings of the great mantra Soham. Are you ready to enjoy the taste? Fine. Let us get started! Soham is a Sanskrit word formed by two words: Sah (he) and Aham(I). By Sanskrit grammatical rules of sandhi(fusion of two words), these two words are combined to give Soham. What is the meaning then? Simple. Soham means He I (am) or I am He. Soham means my Individual Self is Universal Self. This is the highest no-dual philosophy taught by Shri Shankara Bhagavatpadah as proclaimed by our Upanishads and Vedic Scriptures. We are God. Our real Self(real “I”) is nothing but God. We cannot understand this eternal truth due to ignorance. Our Supreme Spiritual Masters help us by removing the ignorance to realize our true Individual Self that is not different from God. Soham is breathing process. So, it is the basis of our life. Our inhalation makes the sound “Soooo” and exhalation is “ham”. Some masters identify it in the reverse way: Sooo on exhalation and ham on inhalation. Both are equally valid. They are same, just like Shiva and Shakti(vide infra). Each and every breath reminds us the non-dual principle of Vedas, we are not different from God. Sometimes, Soham is called Hamsa mantra also. Some Scriptures regard incoming breath as ham and exhalation as sah. Although, the word Aham gets shortened to ham, the meaning remains the same. Also, in Sanskrit Hamsa means a white swan that symbolizes the Individual Self. Thus, non-dual awareness of “I am the Universal Self ” is intricately connected with our breathing. This is why focusing our attention on the breath is an extremely powerful technique to go into a deep meditation. We can connect with the our real nature of all powerful Universal Self by via Soham i.e. breathing! Caution: Any focusing on breathing or chanting Soham must be done under the supervision of an experienced Master. Our breathing itself chants Soham as mantra automatically for us. All we need to do is to bring our attention to it to transcend ourselves into a meditative state. How? The power of all mantras, Shridevi transcends us to a Samadhi state. Since Soham is chanted involuntarily in breathing it is also called Ajapa japa(no chanting by us, but automatic chanting by itself!) or Ajapa Gayatri. As discussed above Soham is formed by two words: Sah (He) and Aham(I). He is Shiva . Every Sanskrit letter or word is loaded with immense power of Shridevi. Aham is the collective power of letters A to Ha in Sanskrit alphabet, i.e. Parvati. It means that, the power of Shiva and Parvati present in our inhalation and exhalation. In other words, Shiva and Shakti form breathing that sustains our lives! As described by the greatest poet Kavikulaguru Kalidasa, Shiva and Parvati are like parents; they protect us. Along the similar lines, here is another tantric perspective. Sah is Shiva. Aham is Shiva’s “I” awareness which is also called Vimarsha in our Tantras. So, Soham means Shiva and his power Parvati (Shakti). Sah is He(Universal Self a.k.a God) and Aham is I. We think that we are separate from God due to ignorance. The moment we get the touch of Guru‘s(Master’s) Grace, we realize that we are not at all different from God. By the Grace, we actually merge with the God by real yoga. Similarly, merging two words Aham (I) with Sah (God), we get Soham. In other words, Soham implies the process of merging ourselves with the God, i.e. real traditional yoga. How can we understand the real meaning of Soham? Actually, Soham is a very mystical word. The meaning of Soham cannot be clearly understood just by reading; one has to realize Soham by experience through practice of traditional yoga with the help of a Realized Master(Sadguru). Why? As discussed earlier, Soham is nothing but Shiva and Shakti together. We need to merge with Shiva and Shakti. Soham itself is the Highest Knowledge. So, the realization of Soham is the greatest purpose of life. We hope that the message is crystal clear now. This entry was posted in Vagartha and tagged about soham, ajapa gayatri, soham, soham mantra, soham meaning, what is soham, what is the meaning of ajapa gayatri, what is the meaning of soham, who am i. Bookmark the permalink.